The congressional supercommittee established in the debt ceiling deal has about a month left to come up with trillions in deficit reduction and then move its plan through Congress, lest the dreaded "trigger" go into effect that would viciously cut defense spending and more. So what if the supercommittee gets stuck on, say, tax increases that Republicans will never accept? Will they just give up and let the trigger go into effect? Nope! Old man John McCain let us onto the real Plan B yesterday. "If there's a failure on the part of the supercommittee, we will be among the first on the floor to nullify that provision. Congress is not bound by this. 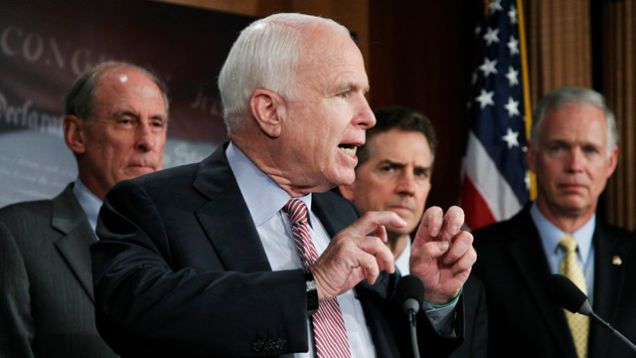 If something is passed, we can reverse it," McCain responded. But then what's the purpose of creating a trigger, if Congress can simply overturn the budget cuts, another reporter asked. McCain simply said: "I didn't agree with the trigger being created to start with. So I have no ownership of that." Now, sure, McCain tends to run his mouth a lot. But if the supercommittee fails, do you actually think that these Congress critters — and the White House — are going to rip defense spending to the core? Nah. They'll just overturn the whole trigger idea, congratulate themselves for pretending to give it the old college try, and forget this supercommittee fantasy ever went down. Which wouldn't be such a bad thing.